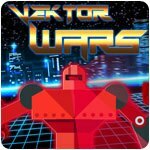 Vektor Wars Game - Download and Play Free Version! Welcome to an 80's neon future inspired first person cyber shooter. The year is 1997 and you are Commander James Moses, a Space Ranger. Your mission: destroy the robot death army, rescue the Robodudes and save the world! 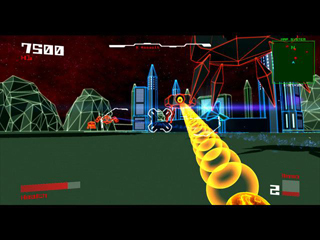 Select your weapon and use your skills to face down a tidal wave of rogue robots... Shoot, shoot, shoot until they are destroyed! 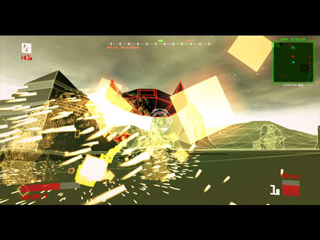 Frantic gameplay, an array of loud and destructive weaponry - you must cheat death at every turn! Fight every imaginable type of glowing metal monstrosity, and watch out for the odd nod here and there to popular sci-fi and video videogame culture. Glowing Vectors and the neon 80's are what this game's visual style is all about. Not just on land but underwater you will experience gaming like nothing before. All originally designed and rendered, lovingly brought to you to make your gaming experience one to remember.